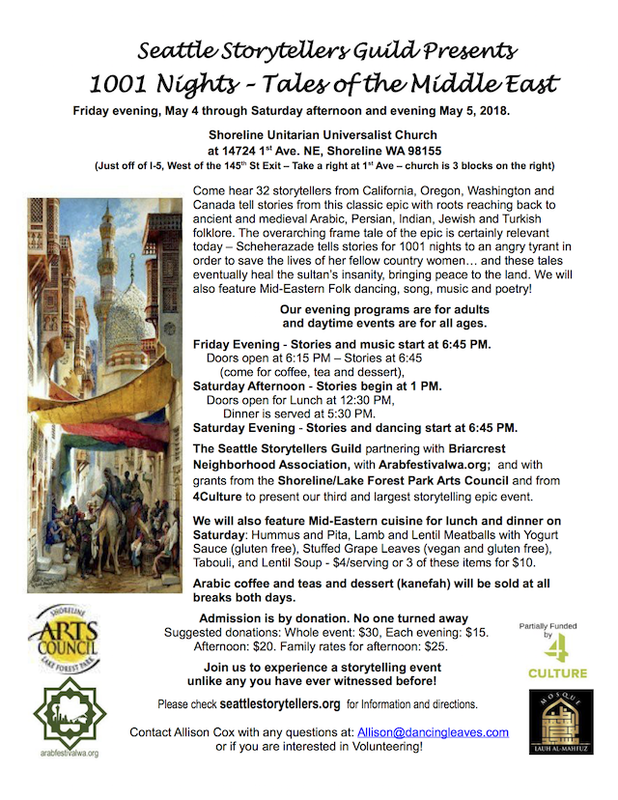 Seattle Storytellers presents 1001 Nights - Tales from the Middle East - Friday and Saturday, May 4-5, 2018 in Shoreline, at the Shoreline Universalist Unitarian Church, 14724 1st Ave NE, 98155. Come hear 34 storytellers from California, Oregon, Washington, and Canada tell stories from this classic epic with roots reaching back to ancient and medieval Arabic, Persian, Indian, Jewish and Turkish folklore and literature. Admission by donations - see above for suggested amounts. Contact Allison Cox for more information.